Double the cheese recipe--skiers are hungry people and there is never a bit left. Blanched broccoli and cauliflower florets, tiny steamed potatoes, grape tomatoes, and roasted asparagus all make for healthy cheese dipping additions. A decadent and fun dinner for guests when served with filet cooked 2 to 3 hours ahead of time. Simply cut the meat into bite-sized pieces and serve at room temperature alongside the bread & vegetables. The pears and apples may be sliced 2 to 3 hours in advance and kept in cold, acidulated water--dry gently with a paper towel before plating. Day old bread is best, but any artisanal loaf will work--the crustier the better. Tucked into the side of the Sugarbush Ski Resort, Chez Henri has been warming up Vermont skiers Parisian style with its bistro menu, huge fireplace, and Italian marble bar for over fifty years. Ski equipment has changed, the Sugarbush Resort developed into a world class skiing facility, and the Green Mountains still cater to a mostly northeastern family crowd. Through all the construction and cultural shifts, however, it is still the Chez Henri fondue served with Red Hen Bakery artisanal slowly fermented crusty bread that lures the après ski crowd in from the cold. This recipe is a nod to Henri Borel and the diamond in the rough he created in what was once the Sugarbush ski school storage room. The cheese is rich and creamy. The green apples and juicy pears help round out the richness of the dish. The vegetables may not be the first on the plate to disappear, but without prompting, skewers soon dive into the plump tiny tomatoes, blanched broccoli and cauliflower florets. The bread matters—choose a crusty loaf from an artisanal bakery and let is sit out uncovered for a day. The 18th century Swiss fondue using aged cheese and wine to make stale bread palatable, is as much a social eating tradition as it is a culinary one. Remind family and friends that they must not drop meat, bread, fruit, or veggies into the pot. Folklore suggests that anyone who loses their food in the cheese must kiss the person sitting next to them--a peck on the cheek is all that is required. For larger groups and longer tables, STAUB CAST IRON MINI FONDUE POTS are perfect for two-at-a- time dipping when set between guests. 1. Rub the inside of a heavy saucepan with the garlic. Discard the garlic. 2. Add the wine and bring it to a simmer over medium heat. 3. Gradually add the cheese to the simmering wine, stirring constantly in a zigzag pattern with a wooden spoon to prevent the cheese from forming a ball. Cook until the cheese is melted and the mixture is creamy, stirring constantly. 4. Combine the cornstarch and water in a cup and mix well. Slowly stir into the fondue. Cook for 5 minutes or until thickened, stirring constantly. Stir in the Kirsch. 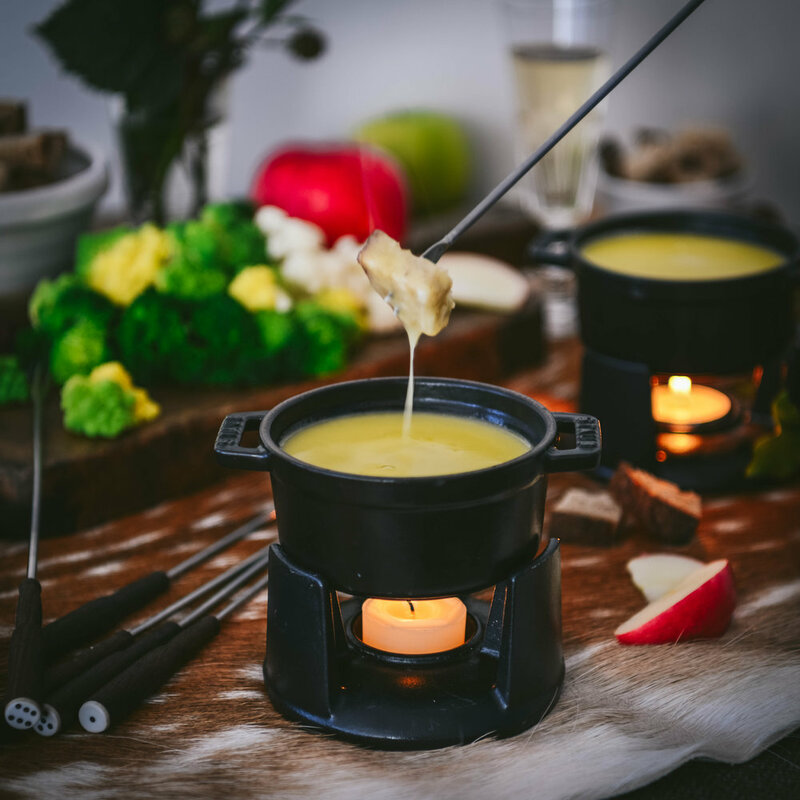 Pour the cheese into a fondue pot(s) and set over a flame to keep warm. 5. Serve with a variety of fruit and/or vegetables and the warm bread cubes.